Safe for glass, wood, plastic, granite, cloth, skin & every surface. It's an exceptional all-natural anti-bacterial agent for all surfaces including pillows, food prep areas, exercise equipment, desks, toys & changing tables, door knobs, phone receivers, keyboards, etc. Spray in/on the eyes, ears, nose, throat, lips, hands & feet. It's an exceptional antibacterial & the best way to manage pathogens, bacteria, fungi & viruses. 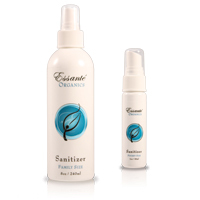 Our Customers & Executives use it against eye styles, strep throat, cold sores, athletes foot, acne, surface pathogens & more because bacteria & fungi find it almost impossible to survive in 100% stabilized oxygen, the primary active ingredient in Essante Organics Sanitizer. Bacteria can cause havoc. If someone feels the onset of a scratchy throat, spray generously into the mouth & throat. If a cold sore is lurking under the surface, spray on the lips. Use on acne or on an eye style to help eliminate a bacterial infection. Spray in ears to assist with infections & on the feet to stop itchy athlete's foot. It can be a strong armor & flu-fighting aid as it manages bacteria & other pathogens effortlessly during flu season & all year. Pack 1 in your purse, briefcase, car, gym bag, desk, diaper bag, junk drawer, backpack, kitchen cabinet, bathroom cabinet, etc. Keep 1 with you always to quickly sanitize your hands & all surfaces you're about to come in contact with. People will ask about it & then they'll order it from you! Order several EMPTY 1oz containers! Fill with Sanitizer & take with you or pass as gifts or samples. Keep 1 in your gym bag, purse, glove box, desk, etc. They're a perfect parting gift for family, friends & prospects. Invite everyone to bring over their favorite product (toothpaste, shampoo, cleaning agent, etc.). Share www.EWG.org/SkinDeep & educate guests on living chemical-free. Have them exchange their toxic products with Essante Organics & pass a 1 oz bottle of Sanitizer as they exit your home. Add item 031 to your order today. NOTE: White container protects the active ingredient of stabilized oxygen. Avoid storing in the sun or extreme temperatures for best performance. Our products do not treat/cure disease. Disclaimer: The information on this Essante Organics Independent Distributor website has not been reviewed by the FDA. Products offered for sale herein are not intended to treat, cure or prevent any disease or health condition. No medical claims are being made or implied. Under no circumstances should any information given on this website be taken or understood as a diagnosis, as medical advice, or as directions contrary to the advice of any licensed physical or mental health care professional; and you affirm that you are fully aware that if you desire a diagnosis or treatment for any medical condition, you must consult a physician. If you are pregnant, nursing, or have a medical condition, consult your physician before using any products I feature on this site. Information on this site is provided for information purposes only. It is not meant to substitute for medical advice provided by your physician or other medical professional. You should not use the information contained herein for diagnosing or treating a health problem or disease or prescribing medication. You should read carefully all product packaging and labels. If you have or suspect that you have a medical problem, promptly contact your physician or health care provider. Apparent Authority Disclaimer – This website is not owned by, promoted by or part of any joint venture with any of the companies mentioned on this site. This is a personal blog site that is also engaged in commerce as an independent distributor/contractor. The site owner has no authority over or within Essante Organics.